Tom Bacon has suffered a bad back injury. Peterborough Panthers have lost a second rider to injury in the space of a week. The table-topping city club’s number one Scott Nicholls suffered a broken ankle in a crash while guesting for SGB Championship rivals Ipswich last Tuesday night. And their injury woes worsened last night (September 8) when reserve star Tom Bacon sustained a suspected fracture in his back in a spill while riding for National League side Birmingham. Bacon was taken to Addenbrooke’s Hospital in Cambridge following the heat one crash at Mildenhall which led to the abandonment of the meeting. Panthers team boss Carl Johnson said: “To lose two riders to injury at such an important stage of the season is really unfortunate. “Of course our first thoughts are with Tom and we very much hope his injuries are not as serious as the first reports suggested last night. Panthers are in action today (September 9) when hosting Berwick at the East of England Arena (5pm). It’s their first home meeting for five weeks and final Alwalton outing of the regular SGB Championship season. 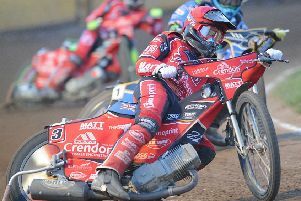 They have turned to two Redcar riders to fill the injury voids in their line-up with Thomas Jorgensen stepping in at number one and Jordan Stewart covering for Bacon at reserve. Panthers, who have seen their lead at the SGB Championship summit slashed in recent days, are at least boosted by the return of Ulrich Ostergaard after almost two months out with broken ribs. They now sit two points clear of Workington, who rocketed from seventh to second by winning back-to-back home meetings against Newcastle and Redcar last night. Berwick, on the other hand, have been pushed down to seventh place, but remain well within reach of a play-off spot.